Cooking is as much about the mistakes as it is the successes. Believe me, I have learned the hard way, especially when it comes to making ravioli. The first time I tried to make homemade ravioli, the dough was too thick and not cooked through and contained a filling that was watery. Later, I learned how to properly make pasta. Again though, I am not the master pasta maker. I’m fairly sure an Italian grandmother would slap me on the hand repeatedly to let me know all the mistakes I make whilst putting together fresh noodles. Still I persist. Practice makes perfect however, and now I throw together some pasta dough like it’s no big deal. But, when it comes to making ravioli, I still face my challenges. First I overstuffed the filling, making a gigantic split mess and leaving mangled ravioli in my wake. Once I got the right amount of filling down, I forgot to dust everything in flour which in turn caused the gooey pasta down to stick, tear and break. I thought things were looking up when I learned to properly fill ravioli and dust everything the pasta dough touches in flour. I was downright optimistic about my skills until right at the end when it came to cutting it and making them look pretty which is something I always struggle with. Some would say I have the decorating skills of a single dad. The point of this whole story is to let you know that, if you are like me and struggle with this process, this art form of Italian pasta, then don’t worry. Practice makes perfect and nothing ever worth having or doing comes easily. If making this pretty little plate of stuffed pasta is more of a challenge then you originally thought, don’t get too down on yourself. Do your best, try again and don’t forget to eat the mangled pasta. It still tastes delicious. In a large mixing bowl, combine ground chicken, Marscapone, chopped thyme, garlic, 1 tbsp of goats’ cheese, sweet Marsala wine, sea salt and egg yolk. Mix until thoroughly combined (no lumps of goats’ cheese, thyme, garlic, etc). Chill in the refrigerator until ready to use. Roll out fresh pasta into thin sheets. I use a hand crank pasta maker and roll out my dough to level 6 thinness. The general rule of thumb is to make it thin enough so that you are able to see the silhouette of your hand behind or underneath the sheet of pasta. On one side of the sheet, drop 1 tsp- 1 tbsp of filling along the end of the pasta dough. The amount of filling used will depend on how big you want your ravioli to be. Make sure to space them about 1 in/ 2 cm apart. Lightly wash the side of the pasta side without filling with water or egg wash and fold it over the side of the pasta sheet with the filling. Make sure the edges neatly line up. Using your fingers, press down in the spaces where there is no filling. Start in the middle and work your way out so as to remove as much air as you can. Further seal the dough together at the edges. Using a knife or your preferred cookie cutter, cut out the ravioli. Once made, place the ravioli on a flat floured surface or wax paper. Place it on a tray and freeze for later or cook right away. If you are using wonton wrappers, you’ll want to lay them out flat on a large surface in pairs. Drop a dollop of the filling in the center. The amount will depend on the size of the wonton wrappers and personal preference. Start with a teaspoon of filling and experiment with larger and greater amounts. Be careful not to overfill the ravioli as this can make it difficult to seal the pasta together and cause the ravioli to fall apart when cooking. Brush the plain wonton wrappers with water or egg wash and place on top of the wonton wrappers that contain filling. Pinch down and seal the edges together on one side and continue pinching around the ravioli until sealed making sure to be careful not to trap any air inside. Once formed, place the ravioli on a flat floured surface or wax paper. Place it on a tray and freeze for later or cook right away. Heat a large pot of water. Add ravioli, gently stir and bring to a gently boil. Allow the ravioli to float to the top and cook for 2-3 minutes at a gently boil. Carefully drain the ravioli and gently toss with sauce. Using a blender or food processor, puree together the cream and sun dried tomatoes. Be careful not to overbeat. Transfer puree to a saucepan or pot and heat over low/medium-low heat until sauce is slightly bubbly. Gently fold ravioli with sauce and garnish with a sprinkling of goats’ cheese. For using wonton wrappers, you’ll want to lay them out flat on a large surface in pairs. Brush a plain wonton wrappers with water or egg wash and place on top of the wonton wrapper with filling. Pinch down and seal the edges together on one side and continue pinching around the ravioli until sealed making sure to be careful not to trap any air inside. Make fresh pasta dough. The general rule is 100g of flour per 1 large egg and a drizzle of olive oil. Mix together and knead for 10 minutes. Once finished kneading, form into a ball, drizzle with oil and let rest. In a large mixing bowl, combine ground chicken, marscapone, chopped thyme, garlic, 1 tbsp of goat’s cheese, sweet Marsala wine, sea salt and egg yolk. Mix until thoroughly combined (no lumps of goat’s cheese, thyme, garlic, etc). Chill in the refrigerator until ready to use. Using your fingers, press down in the spaces where there is no filling. Start in the middle and work your way out so as to remove as much air as you can. Further seal the dough together at the edges. Using a knife or your preferred cookie cutter, cut out the ravioli. Once made, place the ravioli on a flat floured surface or wax paper. Place it on a tray and freeze for later or cook right away. Cook, toss in sauce and garnish with a sprinkling of goats’ cheese. Transfer puree to a saucepan or pot and heat over low/medium-low heat until sauce is slightly bubbly. Season with salt and pepper to taste. 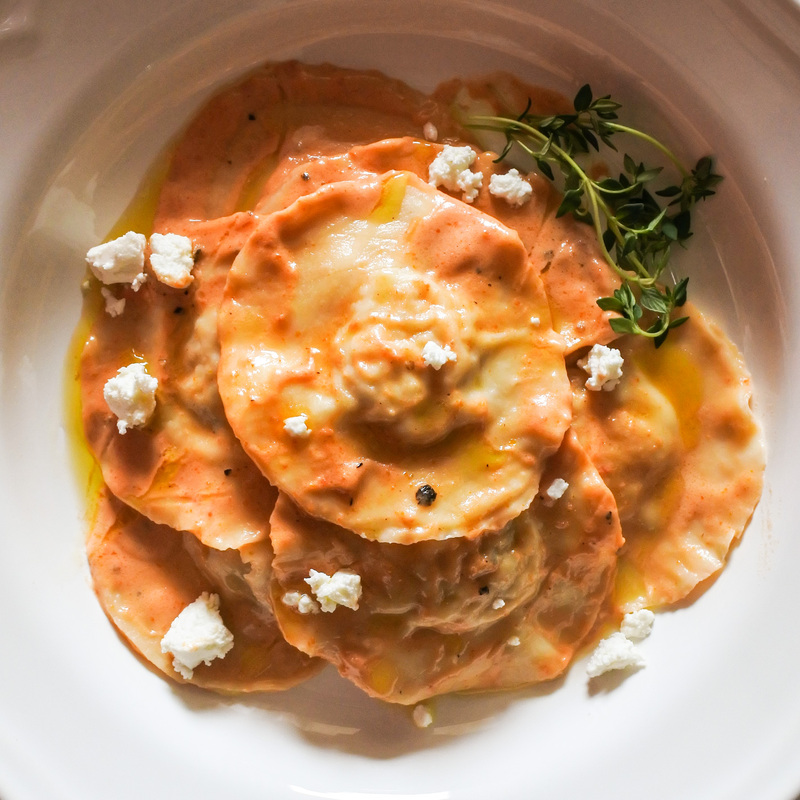 Gently toss ravioli with sauce and garnish with a sprinkling of goats’ cheese. Thanks! It’s one of the best ravioli dishes I have made thus far. Super smooth, richly flavored but not overpowering.